Educated at Tohoku University and immediately hired by the Central Research Laboratory of Shimadzu Corporation. 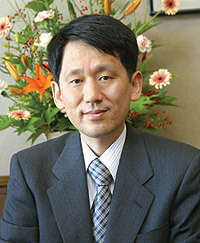 There, Tanaka developed a technique of mass spectrometry, called "soft laser desorption", when in 1985 he used the wrong type of Ultra Fine Metallic Powder as a matrix in an experiment (glycerine base instead of cobalt base). When drying the powder, he noticed a signal peak in a place where it was not expected, the result of ionization. This ionization happily made much more accurate spectometry possible.